SACRAMENTO—On Tuesday, November 5, 2013, the California Supreme Court will return to the newly restored historic Stanley Mosk Library and Courts Building on the Capitol Mall to hear oral arguments in a two-day session, marking the first time the Supreme Court has heard oral arguments in Sacramento since 2009. 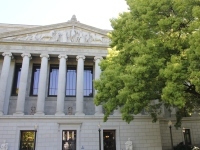 The 1928 building serves as the Sacramento home of the Supreme Court, and the permanent location of the Court of Appeal, Third Appellate District and the California State Library. The Budget Act of 2005–2006 appropriated building construction funds for the now-completed renovation of the building. The restoration project included fire, life, safety, and infrastructure improvements and rehabilitation of the historically significant architectural elements of the building. The Library and Courts Building is listed on the National Register of Historic Places and was rededicated in November 2002 as the Stanley Mosk Library and Courts Building. Tuesday, November 5, 2013 – 2:00 p.m.
Wednesday, November 6, 2013 – 9:00 a.m. The oral argument calendar, accompanied by summaries of the cases to be argued, is also posted on the court’s Website. Each of the oral arguments will be broadcast live on The California Channel as well as live-streamed on its Website. The Library and Courts Building is listed on the National Register of Historic Places and was rededicated in November 2002 as the Stanley Mosk Library and Courts Building. Justice Richard M. Mosk of the Court of Appeal, Second Appellate District, son of the late Supreme Court Justice Stanley Mosk, was randomly assigned, in rotation, as one of three Court of Appeal justices sitting as assigned justices pro tempore during the two-day oral argument session. Seating in the courtroom will be limited and members of the media requesting a media seat at the oral arguments should contact the court’s Public Information Officer, Cathal Conneely.